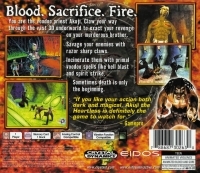 Description: This game is a typical third-person action-adventure similar to Tomb Raider: the player jumps and fights through the stages. Over the course of their adventure they learn new skills which are used to kill enemies and solve puzzles; sometimes by revisiting old levels and using these new skills to reach previously unavailable areas. The player can increase his health bar by collecting voodoo dolls which are lying around in the levels. The camera is set in the over-the-shoulder perspective but can be adjusted manually. Living up to its scenario the levels are designed to deliver a horror atmosphere. 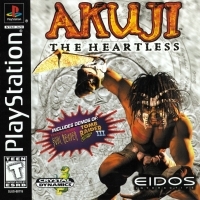 Box Text: In Akuji: The Heartless the player takes the role of Akuji, a voodoo-priest. The title of the game is meant to be taken literally as Akuji's wedding day brought a problem with it: his brother kills him and rips out his heart. Now Akuji has to travel through the underworld to get back to the living and take his revenge. This is a list of VGCollect users who have Akuji: The Heartless in their Collection. This is a list of VGCollect users who have Akuji: The Heartless in their Sell List. This is a list of VGCollect users who have Akuji: The Heartless in their Wish List.